The Enneagram is a rich, multi-layered system that helps us understand who we are and how we live in the world. It uncovers our deepest motivations and shines a light on patterns of behavior we may not have noticed before. With amazing clarity the Enneagram can reveal our inner life and lead us to spiritual growth, wholeness and authentic living. For the last 25 years of my ordained ministry, I found that knowledge of the Enneagram helped me grow in compassion for myself and others. It became an essential tool in my spiritual toolbox in offering insight and practices to help us break free from unhealthy patterns and make room for a more aware, creative, and integrated self to emerge. In my presentation I will offer a very brief overview of the Enneagram and share stories of how working in a spiritual context with this tool can lead to transformation in self -understanding and increased respect for the sacredness of all people. Rev. 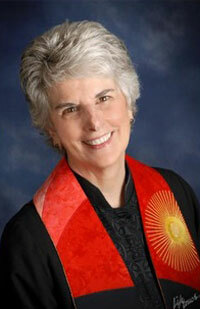 Martie McMane, MA, M.Div, an ordained minister in the United Church of Christ for 35 years, was the Senior Minister of First Congregational Church in Boulder from 2000-2016. As a certified Enneagram teacher for 25 years, Martie has reached well over 1,000 people with her in-depth knowledge of the Enneagram and how its understanding can be transformative for our lives. In retirement, she currently leads workshops, offers spiritual direction, and works with non-profit staffs to help people grow spiritually and increase their self- understanding and compassion. If you are a seeker desiring a closer relationship with God, if you are a person of faith longing for a deeper connection with the Spirit, if you are a fellow traveler yearning to have a more authentic life, if you just wished you knew how to make relationships more meaningful and fulfilling, this book will offer you practical guidance and spiritual encouragement on the way.